Grow Cosmos ‘Sensation’ From Seed. 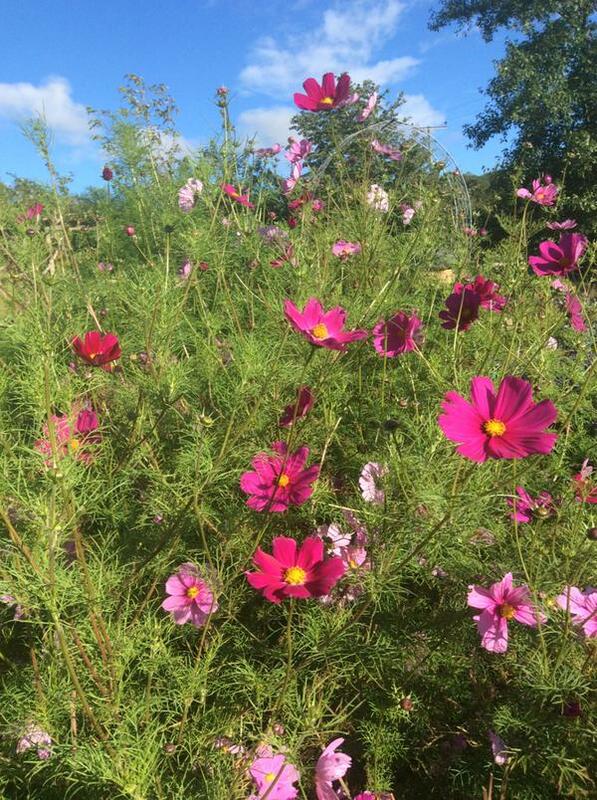 Cosmos ‘Sensation’ is probably the girliest…flounciest..Barbara Cartland-iest of all the flowers I shall be growing in The Higgledy Garden this season. Now you may be thinking what on earth is a macho, alpha male, rugged hunk type, like Mr Higgledy growing such a chocolate box flower as this? …well apart from the fact it’s got a happy vibe…is easy to grow…is ‘cut and come again’ and produces buckets and buckets of blooms…my Aunty Madge likes them…and she is the only one of the family who has kept me in their will…so I like to keep her happy. The Flowers of Cosmos ‘Sensation’ range from Moon Beam White (I made that up) to Carmine pink and will appear from summer until Mr Jack Frost takes them silently to the grave in the deep dark night. They need very little care…but water them if we have a dry spell and plant them in a bed that gets lots of sunshine. At the end of the season don’t rush to pull them out…the seed heads provide valuable food for our feathered chums. 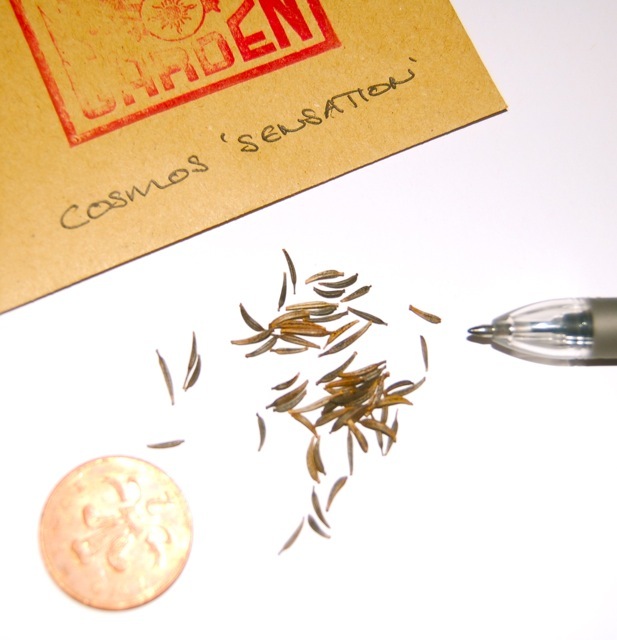 How To Grow Cosmos From Seed. *The second sowing I make outside, and not until the frosts have gone gone gone….one bit of frost and it’s curtains for our flowery ladies…ensure your soil is weed free and down to a fine tilth. I sow in straight lines using a taught piece of string to guide me. *JUST cover the seeds…don’t bury the little gems like they are pirate booty. themselves about the pros and cons of germinating. *Like most of my flowers I space them to about a foot apart. 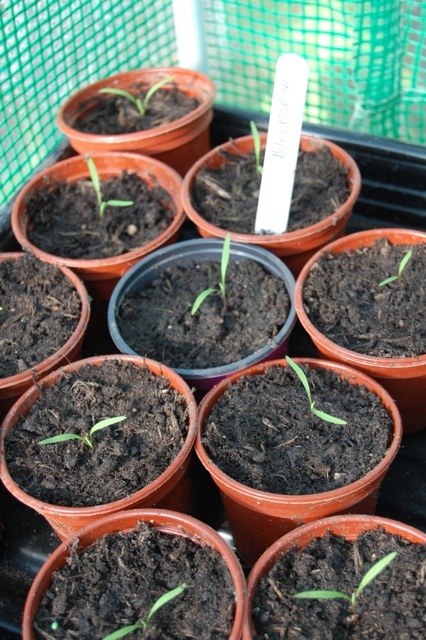 *The seedlings I have grown inside need to be acclimatised to the outside temperatures…so leave them outside during the day for a week or so and I put mine outside around May 15th…though now I reside in Cornwall this date may be brought forward. Check your local ten day weather forecast…if temps look low at night…simply hold yer horses…as Granny Fishcake used to say, “Many a muckle makes a mockle’…or something like that. Cosmos ‘Sensation’ grown by @plansandplants LOVE that colour! *Dead head…or pick newly open flowers for the vase and your plants will provide you with new flowers…failing to do this will send a chemical message to the plant’s mother ship and she will ‘go to seed’ and slow down her flower making factory. *No need to feed Cosmos…if you do you are in danger of getting lots of green growth and few flowers. 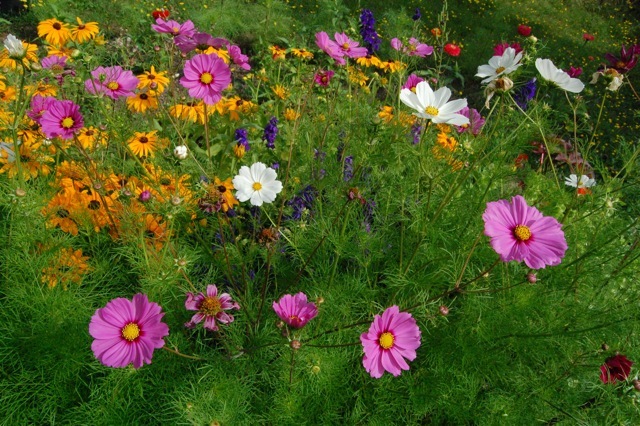 Other great Cosmos to grow are the classic ‘Purity’ and the awesome, super Rock ‘n’ Roll ‘Pied Piper’. Try growing them with Rudbeckia ‘Marmalade’ for a truly nasty clash of colours that EVERYONE will hate…or try with Larkspur ‘Giant Imperials’ for that country cottage, muddy wellies, I’ve got eight spaniels and a land Rover’ look. Most of all…have fun and feel the love. Yeah baby! Grow Lupin, ‘Sunrise’ From Seed. Preparing Cut Flower Beds. rash) on the face that covers the cheeks and bridge of the nose. I’ve been starting a few cosmos from seed recently – my first time growing anything since green bean experiments when I was six. I was losing hope but one finally sprouted today! Looking forward to taking care of them. One of the most powerful organs in human body is the brain. larger orchestra group. When you look at your life you begin to realise that most of the time you are living by someone else’s rules.